University College London collaborated on the AdDIT study and enabled us to offer the cardiovascular assessments across study centres to all participants. AdDIT participants were asked to have 3 tests to assess the health of their arteries. 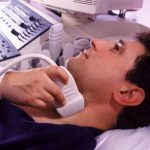 Non-invasive techniques such as ultrasound (the same type of scanner that doctors use to check the development of a baby during pregnancy) were used for all tests. The three tests, described below, measured how thick the participant’s artery walls were (a technique called carotid intima media thickness; cIMT), how stiff they were (pulse wave velocity; PWV) and how effectively they adapted to changes in blood flow (flow-mediated dilatation; FMD). cIMT – A gradual thickening of the artery walls is one of the first signs that someone may develop cardiovascular disease when they are older, and is therefore often measured in young people to try to predict who is most at risk. For this test, we performed an ultrasound scan of the main artery of the neck, the carotid artery, allowing us to measure the thickness of this vessel wall. PWV – The aorta is the biggest artery in the body and has flexible elastic walls that allow it to stretch wider each time the heart fills it with blood. If this artery becomes stiffer, it may also indicate that a person is at increased risk for future cardiovascular disease. We carried out a test to measure how fast the pulse travels along the artery (the pulse wave velocity), as this can provide an estimate of how stiff the artery is. The test involved measuring the pulse in both the neck and the upper leg, from which it was calculated how fast the pulse was travelling. The faster the pulse; the stiffer the artery. FMD and EndoPAT– Blood vessels in your body are able to sense how much blood is flowing through them. If a lot of blood is trying to get through, a healthy artery will relax and widen to try to make this easier. The aim of this test is to measure how much the blood vessels in your fingers and arm relax when blood flow is increased. 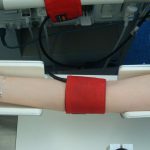 The increase in blood flow will be achieved by pumping up a blood pressure cuff on the forearm for 5 minutes. 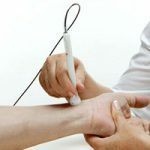 Once the cuff is deflated, blood will rush back into your arm and a small balloon placed on your finger and ultrasound probe placed on your arm will be used to measure how much your vessels relax as this happens. All of these tests provided important information about blood vessel structure and function in young people with type 1 diabetes. This information will be helpful in deciding whether someone with diabetes could develop heart problems later on in life.